Though winter storm Juno isn’t going down in history as the biggest snowstorm to ever hit NYC, it was the first time the city completely shut down the subway system due to a snowstorm. Governor Cuomo and the MTA said the shutdown was necessary because a portion of almost every train line runs outdoors. Not happy with that reasoning? Then you’ll really enjoy this map from WNYC called the Snowpiercer; it proposes how the subway system could operate during a 40-inch snowstorm. WNYC created the map based on previous snowstorms, input from MTA employees, and “some wild speculation,” coming up with a scenario in which 238 of the system’s 468 stations (more than half) would have service, including many of the busiest. 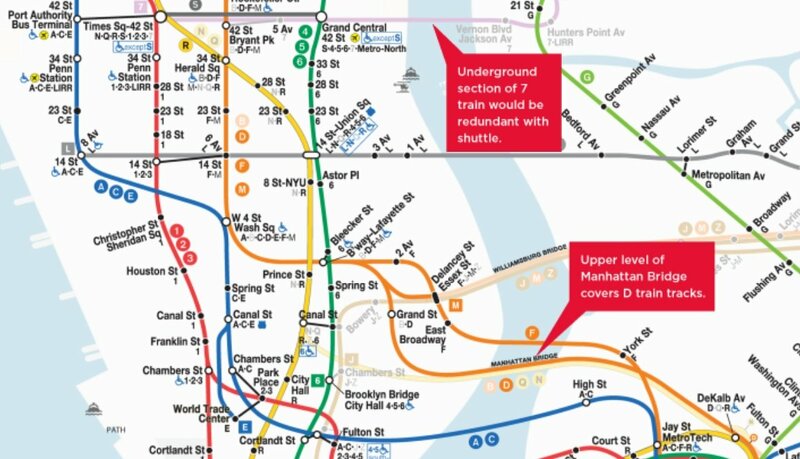 The map shows that outdoor tracks would be shut down, even though the MTA says they have no intentions of doing so, but it does keep those open that travel under covered overpasses.